Take a wide bowl shaped plate and arrange idlis in it. Pour hot Onion (Ullipaya) Sambar on top of idlis. Garnish with chopped coriander leaves and serve immediately. We generally make idlis and eat with Chutney or Chutney Powder or with a cup of hot sambar by the side. Instead make big sized idlis using KUDUMU PATRA. 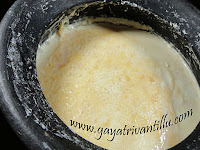 If KUDUMU PATRA is not available, make idli in small katoris Or small basins to get that big shape. Similarly one can also make button idlis by using small sized idli plates. To give variety to a routine tiffin we make idli in different sizes and serve, otherwise even normal idlis also can also be used. Take a wide bowl shaped plate which is slightly deep and arrange idli and pour hot sambar and serve immediately. Normal sambar can also be served but it contains vegetable pieces which do not taste that good with idlis---if there is no problem with vegetable pieces then one can even serve idlis with normal sambar also. To avoid vegetable pieces use Shallot (ullipaya) sambar where shallots are used which have thin skin and they just melt in your mouth unlike normal onions which taste crunchy. 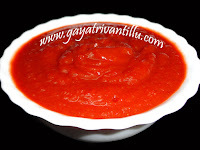 Serve idlis with hot ullipaya sambar and enjoy a great taste.